And the best bit is it's very affordable! 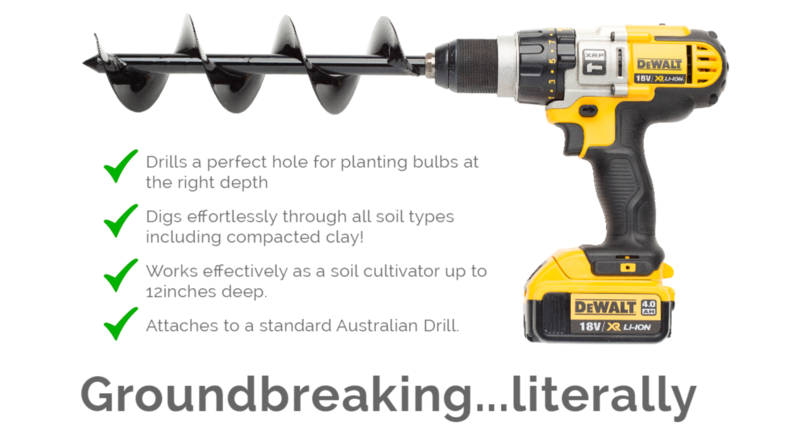 Ranging from $55-$99 depending on the model, it is the biggest innovation in gardening this decade and actually makes digging holes fun! I mixed my own potting compost today using an 18v battery drill mixing the various components in a wheelbarrow using the POWER PLANTER™ instead of the tedious hand or shovel mixing. It was great and did the job perfectly. We have also over the weekend, put in Lilliums, bedding plants and some medium sized natives using the POWER PLANTER™ with so much ease I don't know why no one thought of it before. After all, I have a post hole digger on my tractor so it seems such a logical step. It digs the perfect hole for planting seedlings, tubestock, smaller bulbs and anytime where you want minimal disturbance to the surrounding soil. This is the smallest Power Planter in the range. 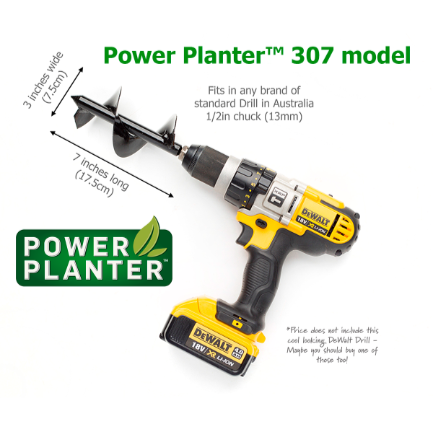 Please Note: Price does not include the drill - you use your own drill and attach the Power Planter to it. 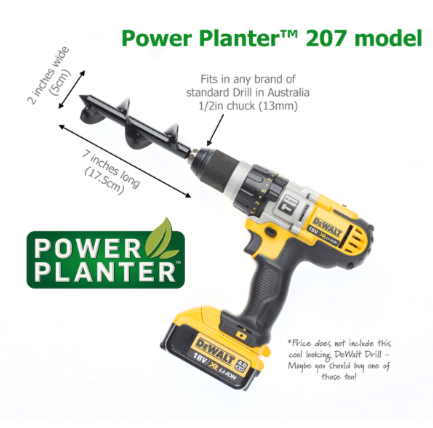 Fits standard Australian cord and cordless drills. It is great for planting larger bulbs like daffodils, 3inch wide tubestock plants, and generally cultivating the soil well to a depth of 7inches. Like all the Power Planter range, it comes with a lifetime warranty. Hand welded in the USA. 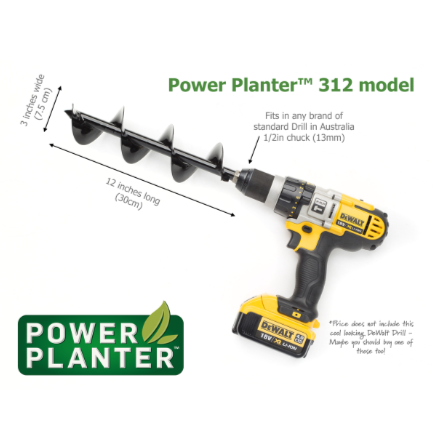 When you need to dig deep, the 12 inch long Power Planter™ makes that job easy. 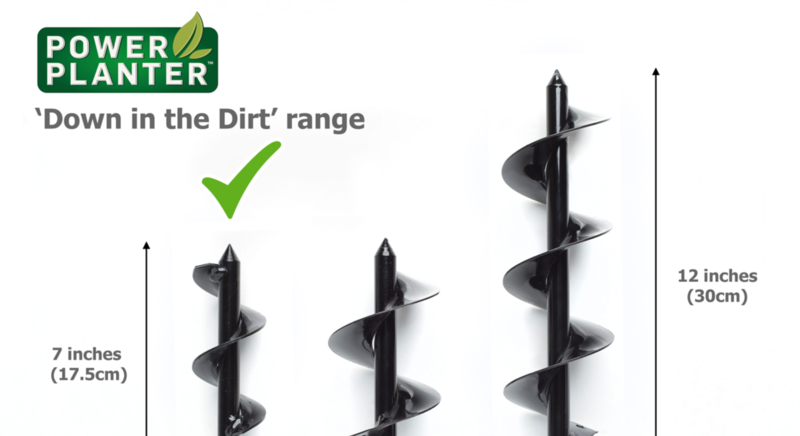 Great for planting and cultivating the ground without having to lift a shovel!Imagine digging deep in the vegie patch the next time you want to plant some carrots and have them come out nice and straight rather than the usual deformed shapes! If you aren't sure which Power Planter to get first - this is the one. The longest in the Power Planter range and popular with landscapers, it allows you to use the Power Planter whilst standing up. So if you have a lot of planting or cultivating to do, then this would be a great choice. It works best on an 18V or higher cordless drill or electric power drill. Other uses for the 324 is for digging deep holes for posts, getting fertiliser tablets down to the roots with tree care, drilling a hole under a path, Mixing up your own blend of potting mix, mixing concrete in a bucket or barrow... so many uses. It is the main one Brian uses on his property at Dural.